The holidays are here, and they are probably causing you just a little bit of stress. Do you have all of the gifts you need? Are you just a few short? Every one is scrambling to get the last of their goodies. We love to help our readers out, and we love to help other small businesses out. This year we wanted to share a sweet and fun gift perfect for any boy, or girl! Green Toys is a great company that makes all of their items in the United States, and they are 100% recycled. They are perfect for playing, learning, and growing. It is important to teach our kids and not just entertain them. 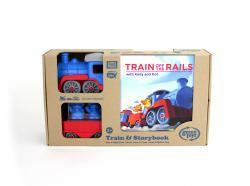 This fun toy, Train and Storybook giftset, will help to feed your kids imagination, fuel their love for reading, and teach them the importance of being green. It is made from 100% recycled plastic and is even packaged with recycled materials and printed with soy inks. Our kids are inheriting this Earth, and with all that they will learn they will know the importance of taking care of it. With toys like this they will see that taking care of the Earth happens in everything we do, even in our toys. Instill in them the importance of caring about something, and doing something about it. Head on over to Green Toys to see more of their fantastic and Earth-Friendly toys. You just might find that last minute gift you need so much! And with the gift of fun will come the gift of the future. This entry was posted in Made in the USA and tagged giftset, green toys, Made in the USA, recycled, the boys store, toy train, Toys, train and book, transet on December 16, 2016 by Lacy.